Published by Joshua Clare-Flagg on 5 Oct, 2016. 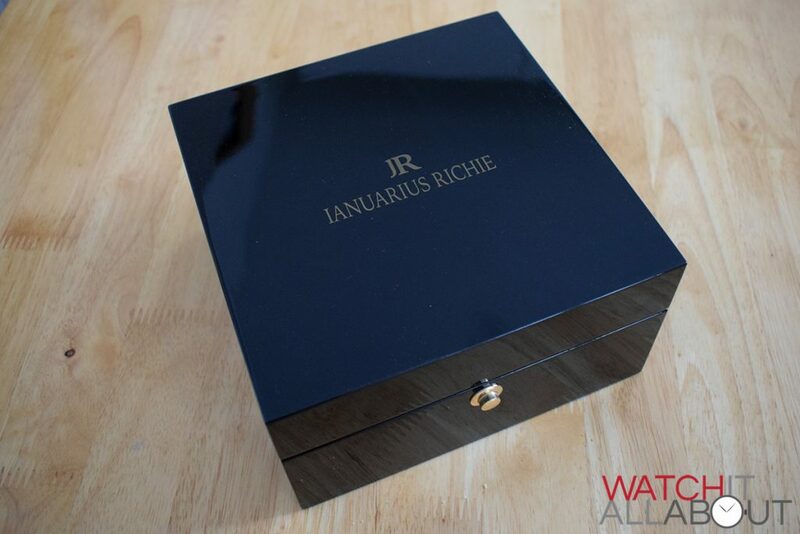 Based in Indonesia, Ianuarius Richie is the brainchild and personal project of Dr Januar Ricky. 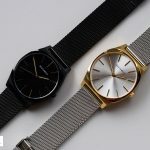 He attempted to gain crowdfunding for the watch early in 2016; but the campaign was unsuccessful in funding. Fair play to him, he didn’t let this stop him and he still went ahead and got the watches manufactured. 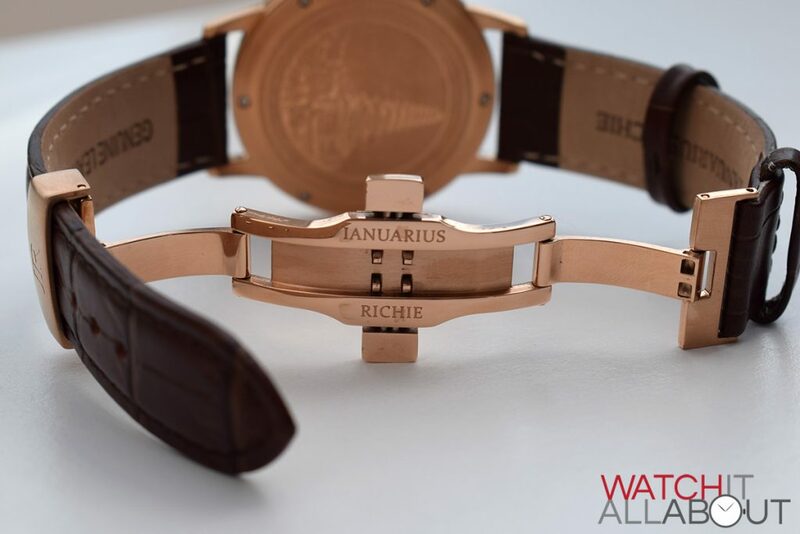 It’s obvious that “Ianuarius Richie” is derived from his own name, but he also claims that it’s linked to the word January in Latin – the God of beginnings or transitions. 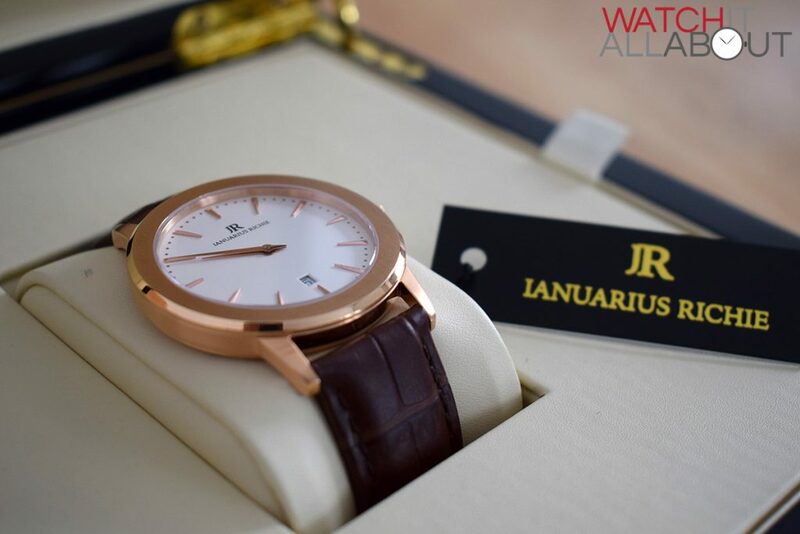 The JR is available with a white or black dial; and it’ll cost you $345 / £255 which is fairly middle ground for an affordable watch. That price bracket is also extremely competitive. Let’s take a closer look to see if it’s a cut above the rest. 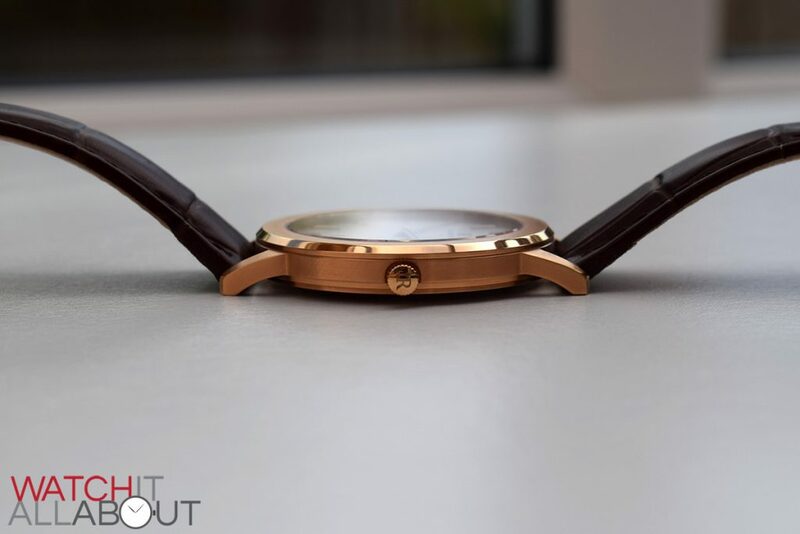 The case is a really good size at 40mm in diameter, and it is super thin at a mere 6.85mm tall. 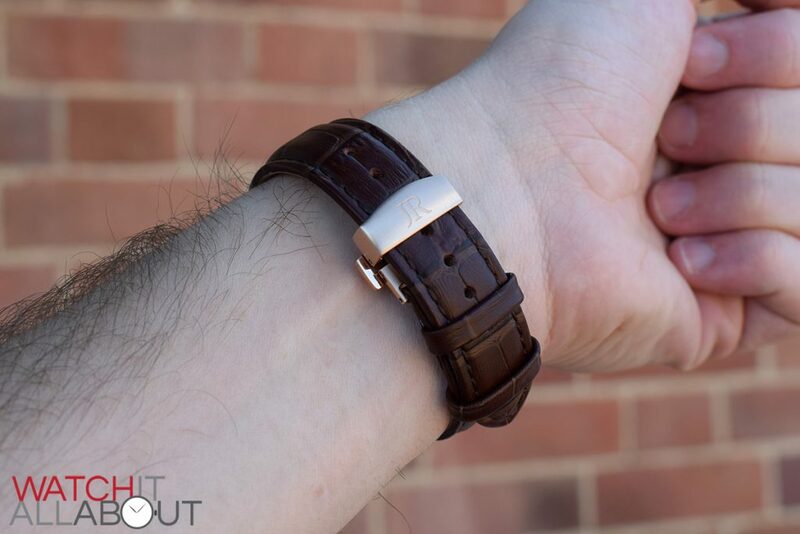 This is perfect for a dress watch as it easily fits under a shirt cuff. The top of the case features a larger than usual bezel, vertically brushed, and I really like it. 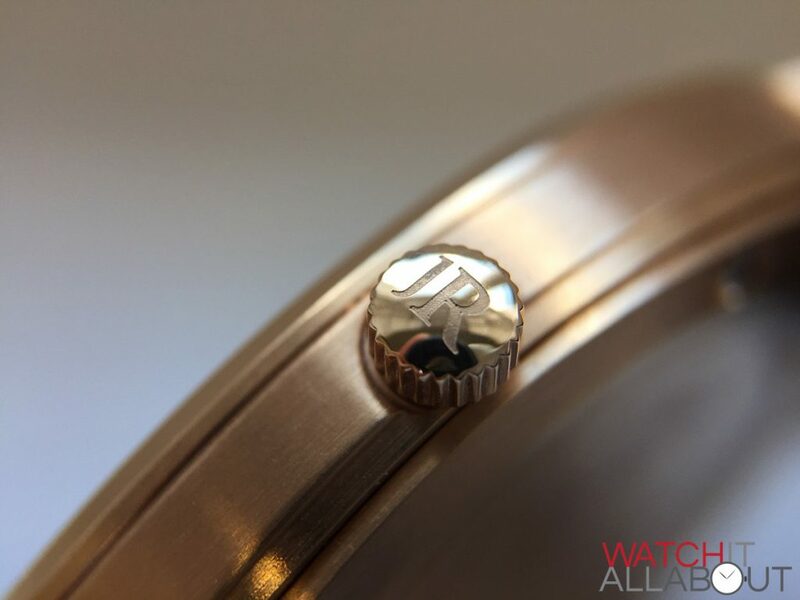 It’s a little different to make the top of the bezel a feature like this. 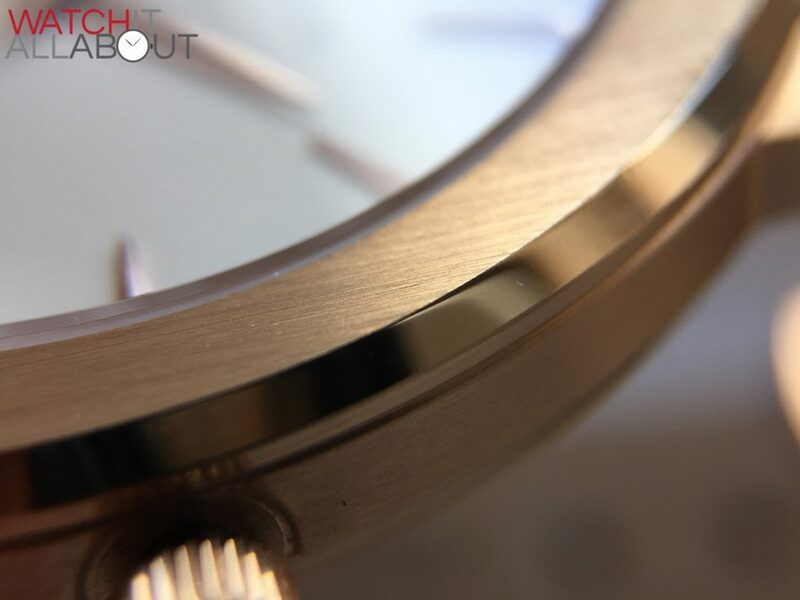 The finishing across the case is excellent, especially on the brushed bezel which has a polished edge surrounding it. It looks very classy and expensive. 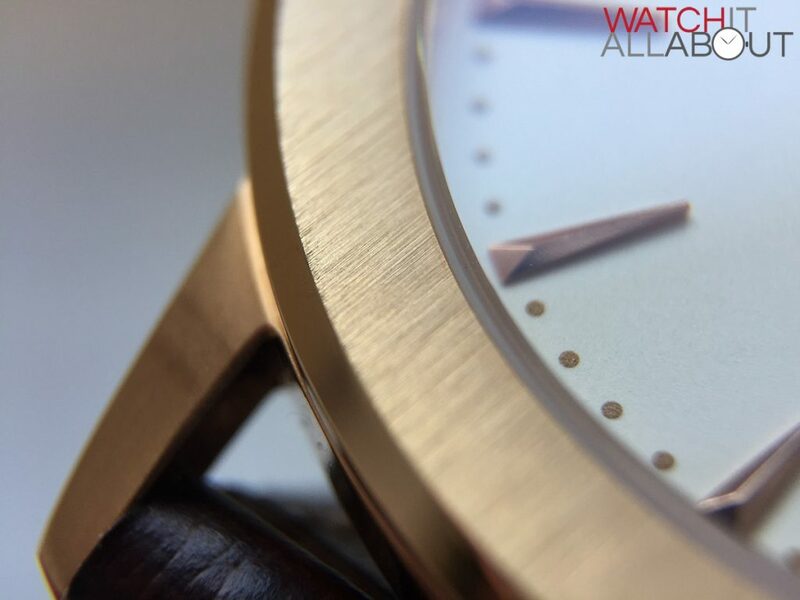 There’s an interesting satin finish to the rest of case (the sides and caseback). I’m not too sure on it visually: I think I would have preferred the same brushing as the bezel. However, it’s still finished well and it probably will prove to be quite hard wearing. We have a sapphire crystal with anti-reflective coating on the underside. It’s flat and ever-so-slightly raised from the bezel. 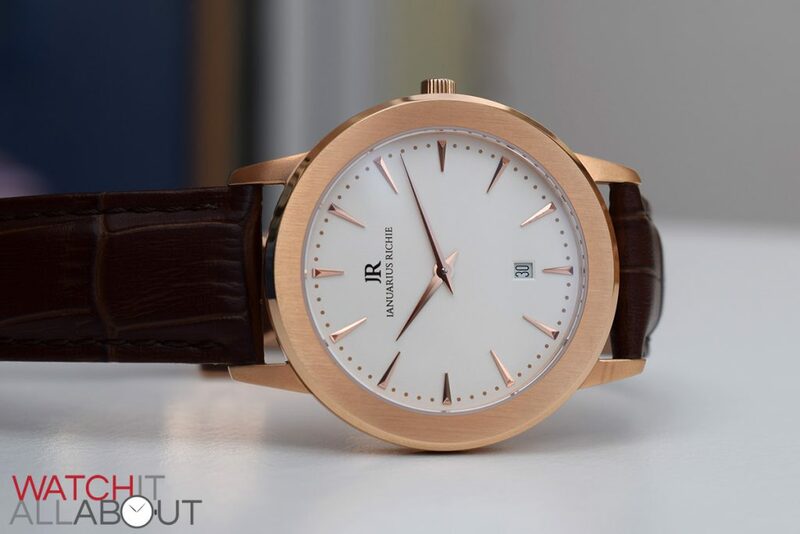 It offers excellent clarity; most definitely helped by the white dial which naturally show less reflections. The crown is pretty tiny with the logo engraved on the end. 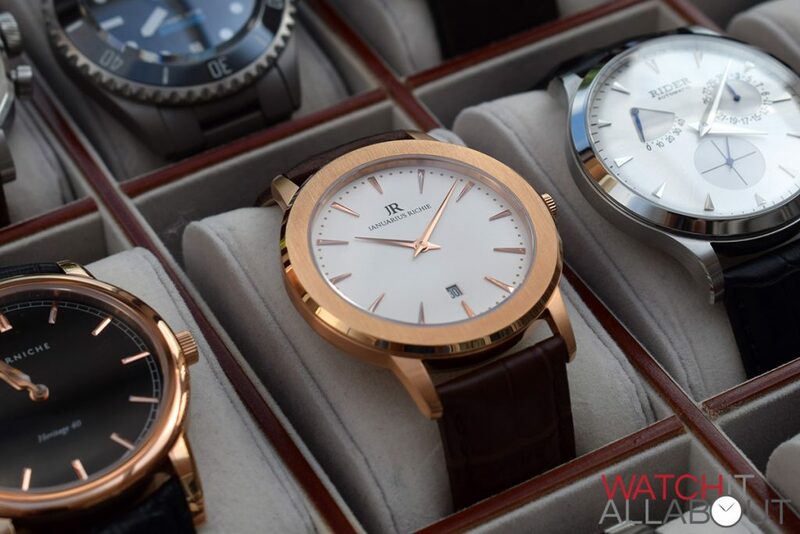 It’s not that easy to use, but as its quartz it’s unlikely to be used much – only really for changing the date and time once a month. 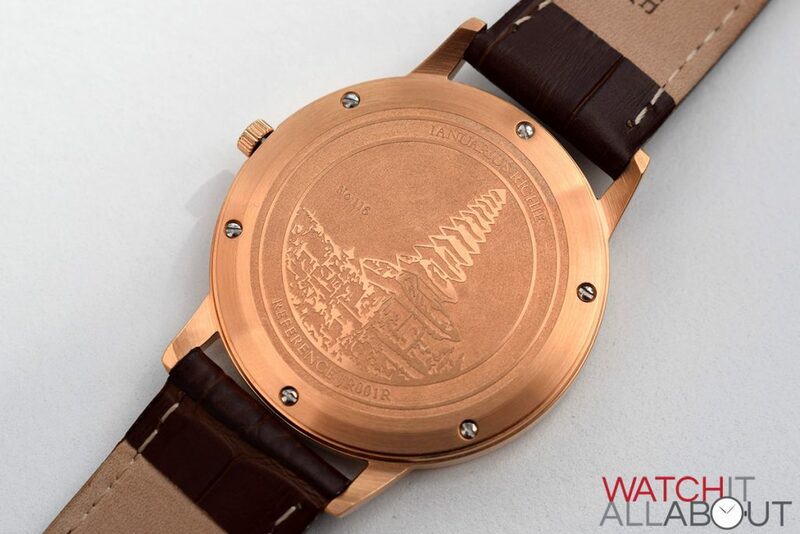 The caseback has an engraving of Pura Ulun Danu Bratan, or Pura Bratan – a major Shivaite and water temple on Bali, Indonesia. This could be a bit deeper to be able to see it better, but it has good definition. This is a nice nod to the brands’ heritage and country of origin. 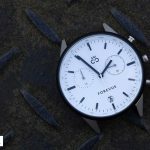 The dial in general is pretty simple and minimal, but it has something about it to set it apart from all the other “minimalist” designs. The dial base is made of a ceramic base, and comes in white or black options. 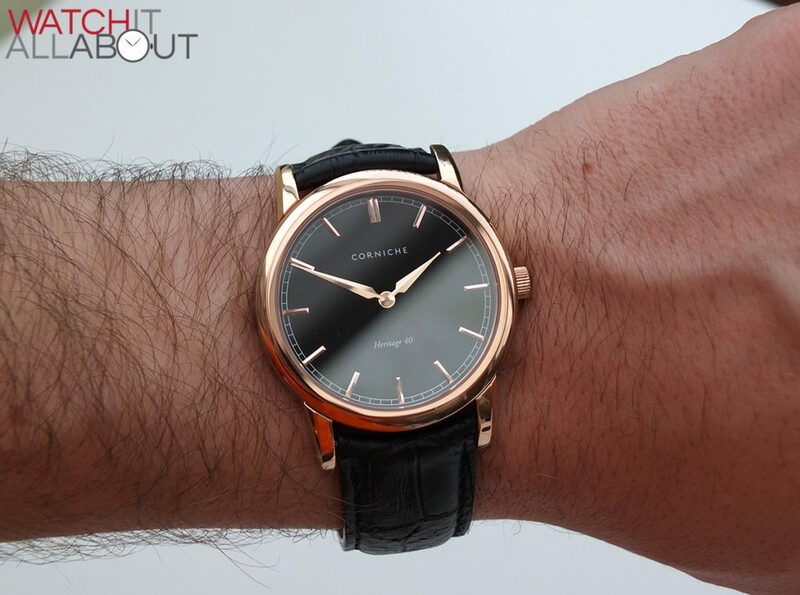 It has a nice glossy gleam to it, which makes the appearance of the watch quite expensive. 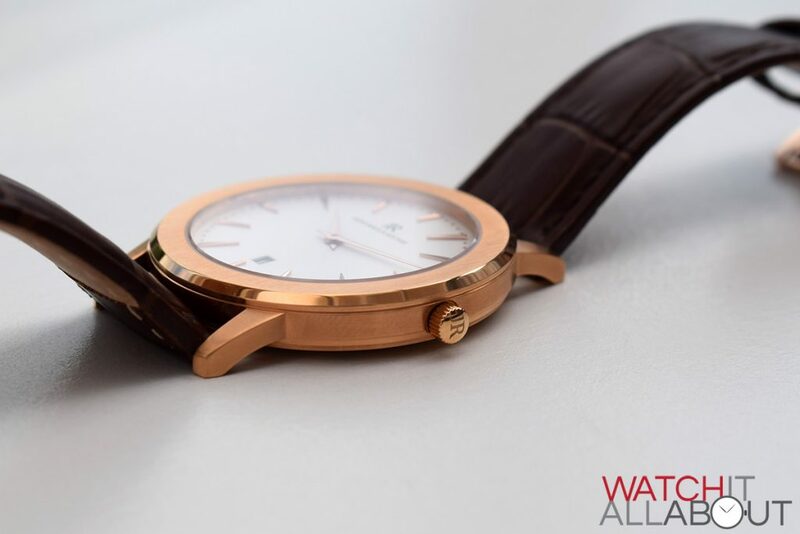 The hands are long reaching dauphine points, made of a polished rose gold plated steel with a tall pitch to them. These create a nice variety of reflections depending on the angle of light. 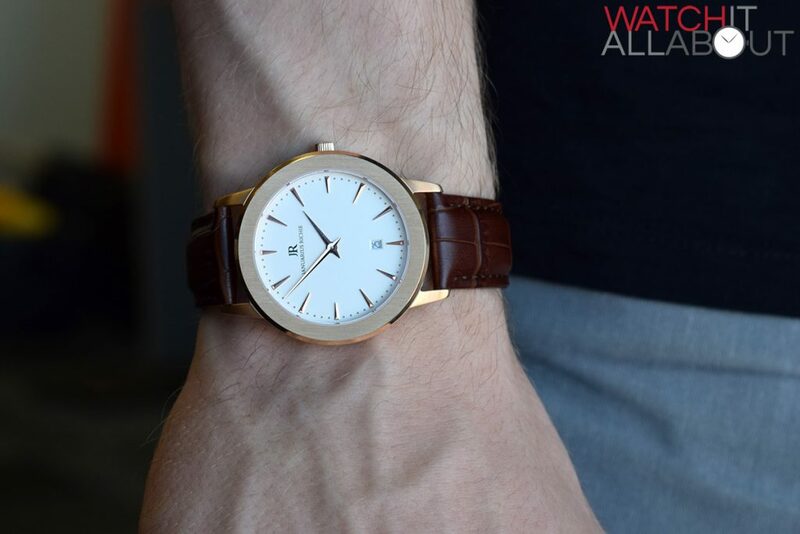 There is no seconds hand, so although it’s a quartz watch there’s no real tell. The applied hour markers are very nicely done. 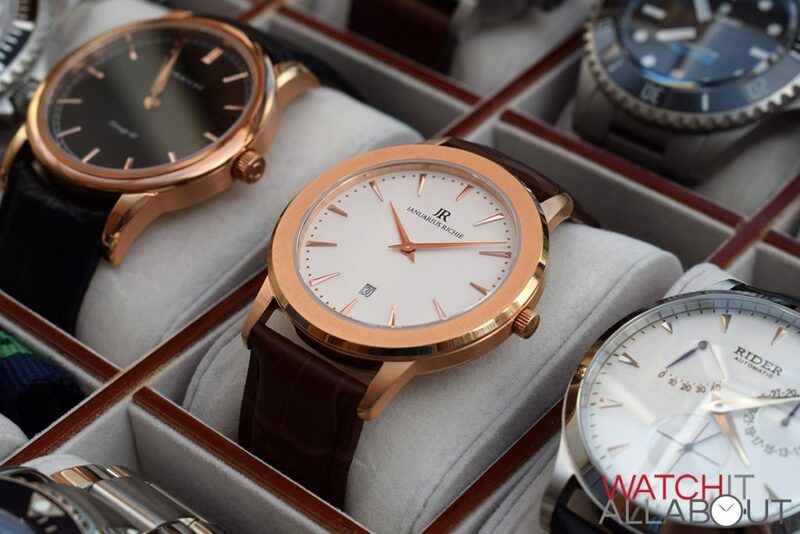 They are three-dimensional triangles that stand tall from the dial, which always signifies good quality. They are shorter at 12, 3, 6 and 9 for a bit of variety. The date window at 6 is nicely cut out of the dial with a gentle border to it. 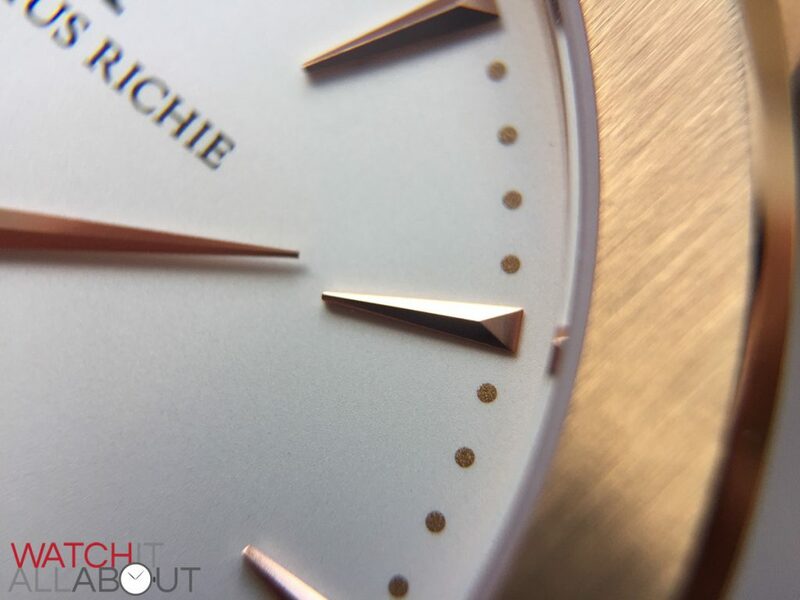 It has a white date wheel to match the dial colour in this instance, although if you go for the black dial the wheel is still white so doesn’t match. There’s not too much printing at all which is good – just the logo in top half and a minute track made out of small discs around the outer rim. 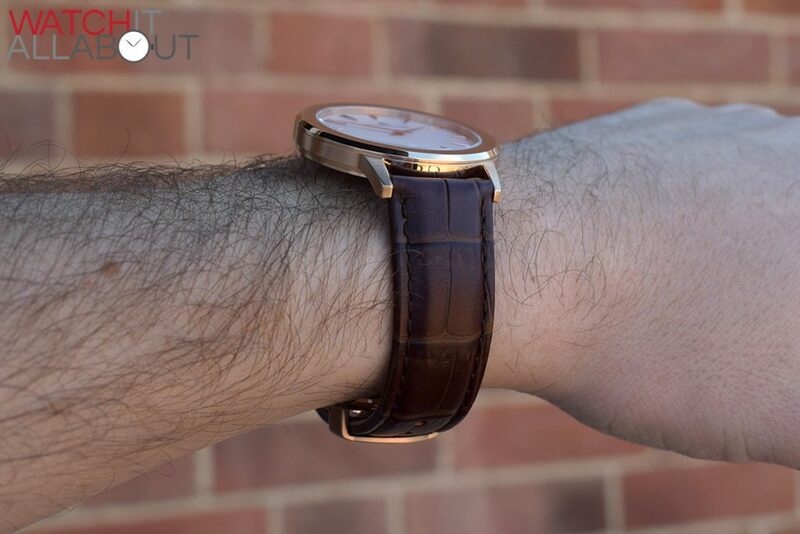 The leather itself has a matte finish that compliments the colour of the case. 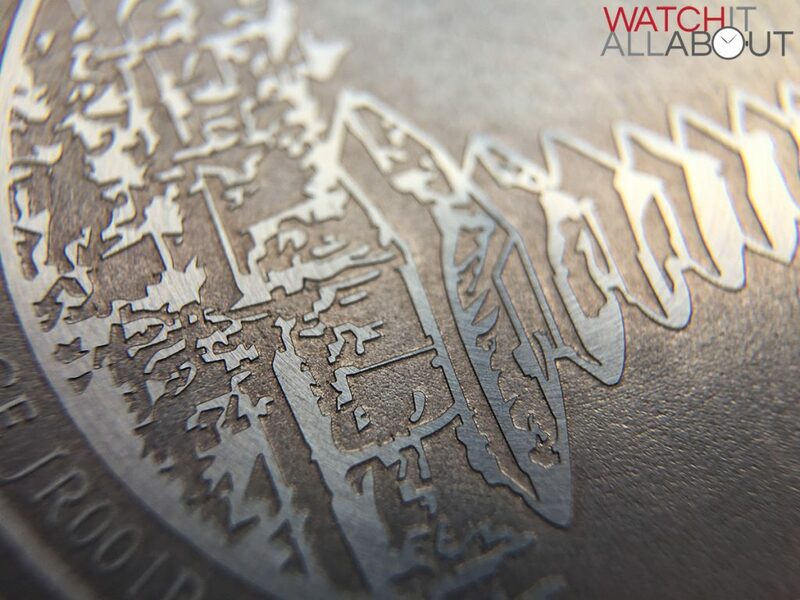 It’s 20mm wide at the lugs reducing to 18mm at the buckle, and has an alligator stamped pattern on the top. Whilst it doesn’t feel the best quality I’ve felt at this price, it looks the part at least. 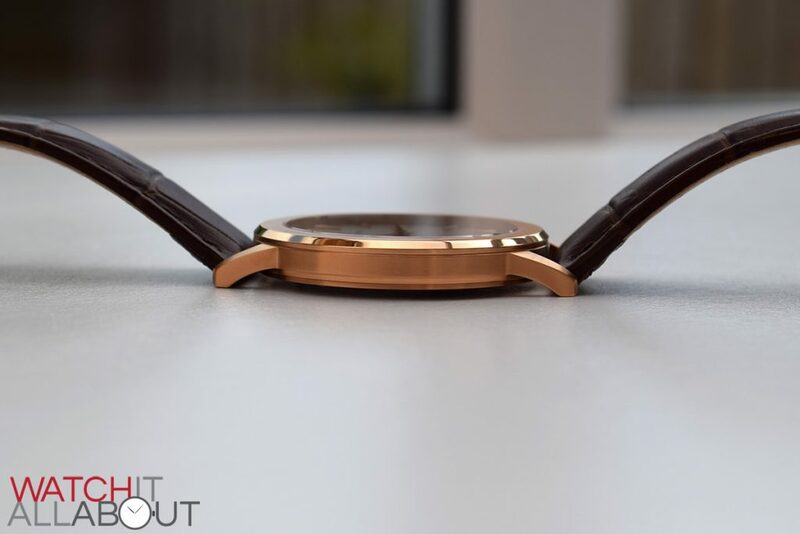 The top bar of the butterfly clasp is the same satin finish as the sides and caseback of the case. This will probably prove to be a good idea, as it seems like it’ll be quite hard wearing in the long run. 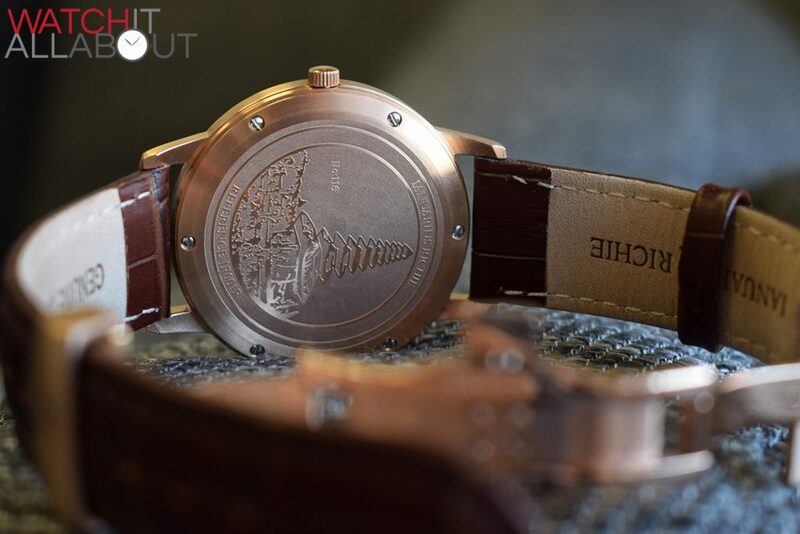 The rest of the clasp is polished and even includes the logo engraved on the inside when you first open it up – a really nice and classy touch. 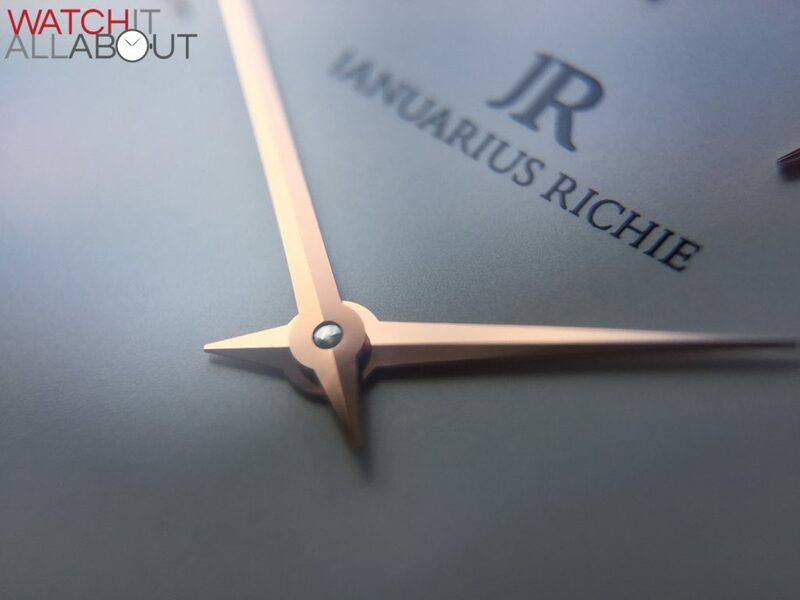 The movement powering the Ianuarius Richie is the Swiss Made Ronda 704. 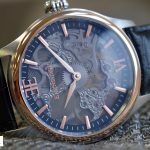 It’s an important touch to include a Swiss movement at this price, considering you can get some full Swiss Made quartz timepieces for less. 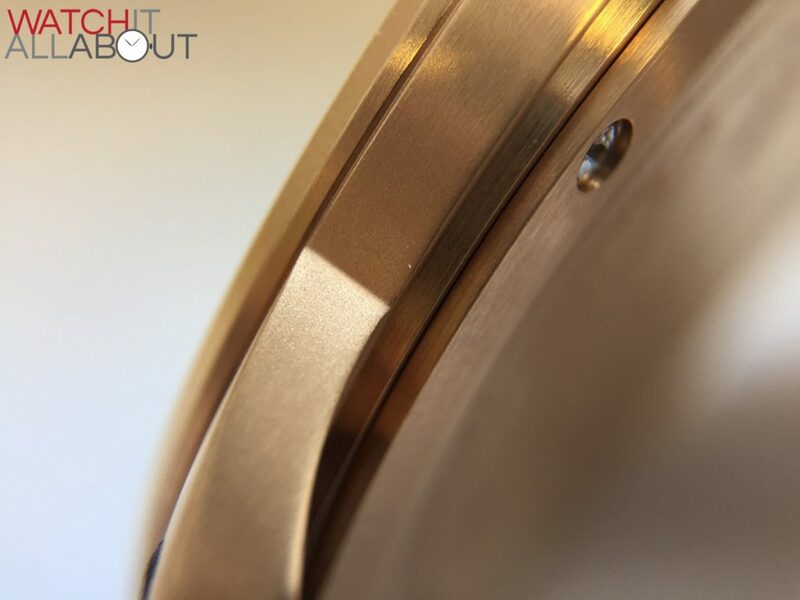 The Ronda 704 is a great choice – it’s incredibly reliable, has a 60 month battery life, 5 jewels, date function, and accuracy of -10 / +20 seconds a month. 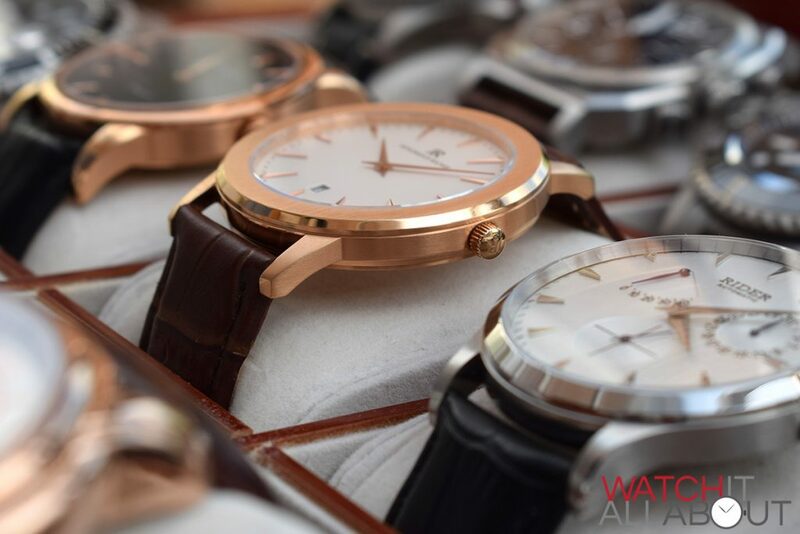 The two main alternatives that come to mind are offerings by Corniche and Christopher Ward. 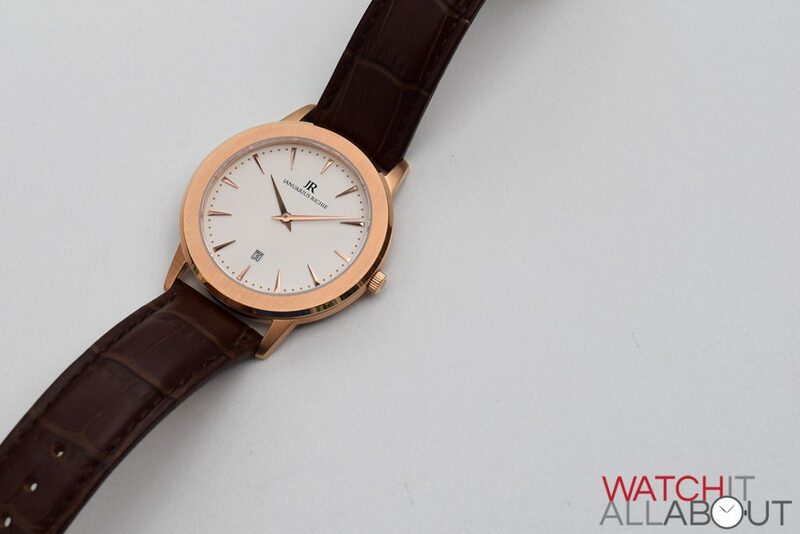 The Corniche Heritage 40 is a great looking alternative: it also has a ceramic dial and is as classy as you like. 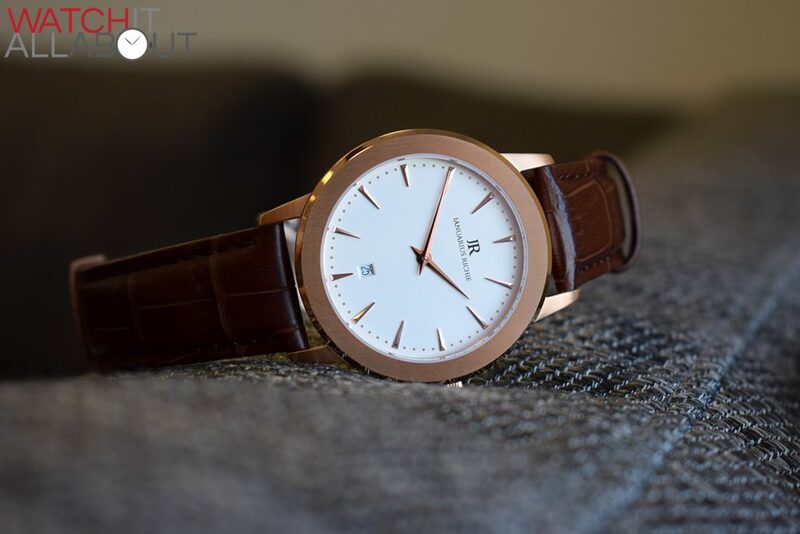 However, it’s more expensive at €325 / ~£300 and doesn’t have a Swiss movement. 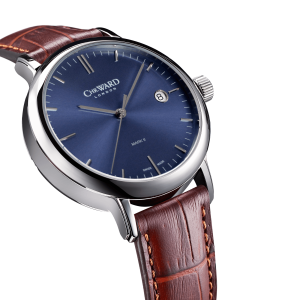 The Christopher Ward C5 Malvern Quartz is completely Swiss made and is cheaper at £199. 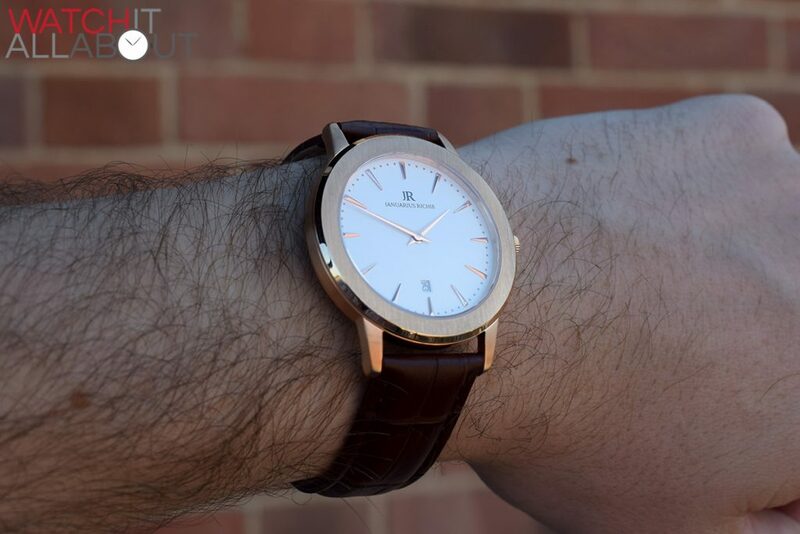 It’s a stunning watch for an incredible price, although visually a little plain compared to the Ianuarius Richie. The Ianuarius Richie does a fantastic job at looking more expensive than it really is. 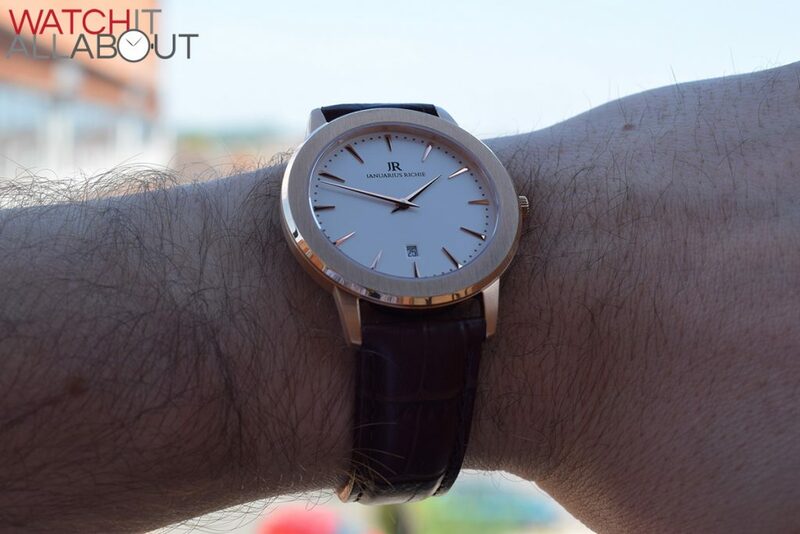 This is mainly thanks to the impressive bezel configuration and ceramic dial with it’s excellently finished elements. 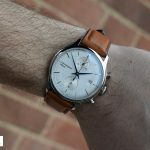 Whilst there are other watches available at this price that are fully Swiss Made, this watch could easily pass as worth double. 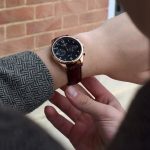 It’s the whole package too; not only the watch but the whole experience is a delight with the piano black presentation case. 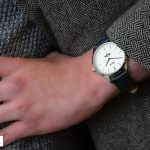 This watch comes highly recommended, and fair play to them for becoming Indonesia’s first decent micro brand.